A disabled neighbour assaulted a shop owner with his walking stick after they had been having a long-running dispute. Andrew Broomhead, 42, struck Lee Speakman, of furniture shop La Maison, on Longden Court, at Spring Gardens, Buxton, on his hand with his walking stick, according to a Chesterfield magistrates’ court hearing. Prosecuting solicitor Leanne Townsend told the hearing on August 29: “Mr Speakman owns a shop and he has owned it a number of years but it’s next door to the defendant’s flat and Mr Speakman describes that over the years there have been issues with the defendant. “He’s had to call police because of behaviour towards him and the defendant approached him in February and he was outside clearing items away but he told him to get lost because of the previous incidents. Ms Townsend added the two men exchanged words before Broomhead struck Mr Speakman’s right hand with his walking stick. Mr Speakman stated he reported the assault in a last ditch attempt to stop Broomhead’s behaviour. The defendant accepted he had been stood with his walking stick but claimed Mr Speakman had been threatening towards him. Broomhead, of Longden Court, Spring Gardens, Buxton, pleaded guilty to assaulting Mr Speakman after the offence on February 19. 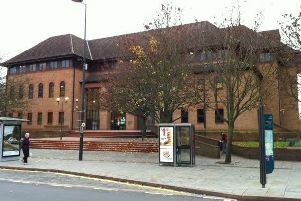 The court was shown video footage of the incident which had been recorded by Mr Speakman. Ms Rowlands added there have been access issues with the shop with items left on the pavement. She explained that Broomhead has got alcohol problems and he suffers with learning difficulties and he has been tripping over things outside his flat. Magistrates fined Broomhead £40 and ordered him to pay £85 costs and a £30 victim surcharge. Broomhead was also warned that if he appears in court under similar circumstances the consequences for him will be much greater.